MAIN POINT: What do we do when all hope is lost? Some vent frustrations outside through riots, or sinful acts. Others through depression inside. Christians need not fret about either. They have the Person of Jesus to hope in. Last week, Vancouver’s hockey team lost the deciding game of the Stanley Cup final. Despite the many positive signs that this year is THE year of Vancouver lifting the coveted cup, the team lost badly. Hopes were dashed. Crowds gathered downtown to watch the game became frustrated that they may never get to see the Cup in their city during their lifetime. As the home team faded away during the game, negative energy rose among the crowds. Disappointment led to sadness. Aggravated sadness led to anger. Anger led to public unrest, and riots led to vandalism and widespread looting. You can see some pictures and videos in my blog here. The police had identified the culprits as a ‘small group’ of trouble-makers who are not hockey fans. 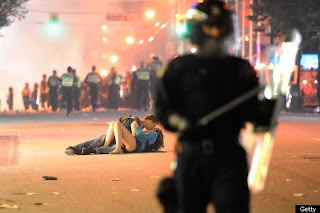 The day after, Vancouver Police chief, Jim Chu blamed the riots on a small group of ‘criminals, anarchists, and thugs.’ Public outcry blamed the whole situation on the city of Vancouver, and the way the authorities have allowed such a huge gathering in the first place. Some blamed the hockey team for not winning! The game of hockey has become a game of blame. I think two factors stand out clear. People riot because they feel a deep sense of injustice and an utter loss of hope. I remember seeing the 1992 LA riots on TV in a hotel room in San Jose. On that infamous day, many blacks attack a sense of injustice when the policemen who are white, were acquitted after having beaten up a black man, Rodney King. Now in 2011, there is also a feeling of injustice. After all, the Vancouver Canucks has been ranked #1 in the league this year. They have scored the most number of goals, allowed the least, and boasts many highly ranked players. They have a hugely important psychological advantage of playing at home to Boston. On top of that, the signs all point to a Vancouver victory. Sports commentators declare it. Canadian politicians affirm that. Psychics predict it. The entire city embraces the ‘guarantee’ of a victory. With such a high hope and expectations, more than a hundred thousand people throng the streets of Vancouver to watch the final game from huge TV screens specially delivered from California. The team loses. Badly. The people take it. Badly. When hyped up expectations are rudely taken down, it is like pouring petrol on the streets waiting for someone to fling a lighted match. Feelings of injustice ignite the whole tragedy. Those of us watching the whole riot scenes unfold on TV feel utterly helpless. There is not much we can do from such a remote distance, except to call our loved ones to leave the downtown neighbourhood as fast as possible. Thankfully my daughter has the sensibility to stay away, opting to hang out in her friend’s house instead. In other words, if you are not helping, then get out! If you are simply standing by not doing anything, move away so that the police can catch the culprits. By standing around videotaping the scenes, curious bystanders are shielding the police from the rioters. They are forming an unnecessary barrier. Their very presence are encouraging the rioters to continue their acts, even to raise their boldness in committing bigger crimes. Worse, those observers can become caught up in a mob-mentality, that will tempt the inner demons in them. For instance, if one sees looters running into an electronics shop and grabbing an iPhone, will that not tempt a man to shed his innocence and to grab one for self? Contrary to what the police has said, two days ago, out of the 8 persons who gave themselves up, 6 of them are first time offenders. This is a fact. There are no such thing as an innocent person. All are guilty. All are in fact one offense away of committing a crime. All it needs is a spark or light. That is injustice. When injustice is sensed all over, people fling rule books out of their vocabulary. Anarchy reigns, spurred on by the nonchalant looks of many bystanders who can do something but chooses not to. Feelings of helplessness erase tangible hope of a better tomorrow. C) "These Are NOT Vancouver Canucks Fans"
With many rioters wearing hockey jerseys doing their criminal acts, it is understandable that people watching the riots from afar tends to paint every single Canucks fans with the same brush, that "Canucks fans are rioters." That too is an injustice. Sensing the negative perception, something good starts to happen.. . . . . . .
A man from Victoria decides to do something about the image of Vancouver hockey fans. Proclaiming that the rioters are not ‘true Canucks fans, thousands sign up for a citywide cleanup campaign. Many volunteer with brooms, scrubs, soap, and cleaning equipment. Within hours after the riots, the city redeems itself once again, as one of the most beautiful cities in the world. Touching indeed. The worst and the best of Vancouver happening within a span of 24 hours. I figure it is pride at stake. I think people who does something good has the sense to realize that injustice does not reign forever. Hope lasts longer. It is my contribution to remind people that a sports game is a game. We need to bear witness as people to people, and not judge one another on the basis of wins or loss, or pride. Sportsmanship is not about winning or losing. It is about bringing out the best in sports, and sportsmanlike behavior. When the Vancouver Canucks lost the final game, I sense that the loss is much greater in the hearts of people. It is a feeling of hope being lost. If the best team after 40 years cannot even win, then where is hope? What is there to hope about? Many find hope that with the public display of images and videos of culprits on social media networks, the guilty will eventually be punished. If not, the images will haunt the guilty ones. They find hope in justice being served in due course. They find hope even in romance during a time of trouble, like this picture which has gone viral. They find hope that there is still something good when everything around looks bad. I remember how the disciples of Jesus behave in the gospels after Jesus was arrested and crucified. Peter deny him three times. The other disciples flee. The women weep. Everyone goes back to their original occupations. In their hearts, Jesus is not the Messiah or the Powerful King they expect. In their minds, Jesus is a loser. There is no more hope. Only later, they will realize that Jesus is that 'something good' that will shine forth more, when all hope seems lost. What do we do when all hope is lost? Hang on to the promise. Hold on to our hopes. Never give up. The gospels reveal something more. It reveals Jesus appearing to the disciples and hundreds of eye-witnesses that he has been resurrected from the dead. This is hope. This is the evidence that the disciples all need to see. This is the reason why the Christian Church grows, and grows and grows. When hope is lost, wait for the appearing of Jesus. Read the promises of Scripture. Remember that Jesus has come, and will come again. The Vancouver Canucks may have lost this year’s hockey game to Boston. There is always a next year. There is always another chance. There is no reason to riot like crybabies. We all need hope, otherwise, we become easy pickings for anarchic behaviour. For Christians, there is no reason to fret or worry about tomorrow. In Christ, we have the assurance that He will come one day, in the most perfect moment, to love all, and to call those who follow Him faithfully to enter into his kingdom, a new Jerusalem come on earth as it is in heaven. Yes, on earth, there is no one righteous, not even one. That is why we need to hope in Jesus, the only fully righteous man to walk the brutal earth. It is because he will come again, we have this everlasting hope. A hope that refuses to be defeated. A hope that never says die. Thought: We may face many defeats in this life, but there is no reason to let our spirits become defeated.